Grolier Club. Hardcover. 160583050X New Condition. . New. Grolier Club. Hardcover. 160583050X Like New Condition. . Fine. Grolier Club, 2013-12-01. Hardcover. Good. Grolier Club Books, New York: 2013. Hardcover with dustjacket. Brand new book. 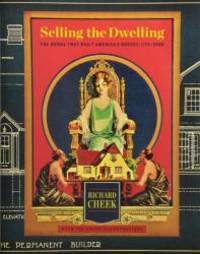 Published to accompany the exhibition "Selling the Dwelling: The Books That Built America's Houses, 1775-2000," on show at the Grolier Club December 11, 2013-February 7, 2014. The evolution of the house design book in the United States is a long and complicated story, filled with architectural creativity and banality, commercial genius and excess, egalitarian and humanitarian ideals, literary and social ambition, can-do individualism, faith in progress and invention, and endless energy. All of these quintessential American traits are bound within the pages of the builder's guides, pattern books, catalogues, and other forms of architectural literature that have competed for the financial and psychological rewards involved in designing and building a domestic haven for every citizen. In this illustrated survey - the first of its kind to showcase the enormous variety and graphic appeal of these materials - Richard Cheek highlights the more visually arresting and socially compelling examples, focusing on books that reveal the character of our country as much as they do the style of our houses. With over 600 examples illustrated in the text, plus an appendix listing several hundred additional items, Selling the Dwelling is a significant contribution to the bibliography of American domestic architecture. U.S.A.: Grolier Club, 2013. 286pp. Illustrated. First Edition. Hard Cover. Very Good/Very Good. Folio - over 12" - 15" tall. New York: The Grolier Club, 2013. hardcover, dust jacket. 9 x 12 inches. hardcover, dust jacket. 288 pages. Published to accompany the exhibition "Selling the Dwelling: The Books That Built America's Houses, 1775-2000," on show at the Grolier Club December 11, 2013-February 7, 2014. The evolution of the house design book in the United States is a long and complicated story, filled with architectural creativity and banality, commercial genius and excess, egalitarian and humanitarian ideals, literary and social ambition, can-do individualism, faith in progress and invention, and endless energy. All of these quintessential American traits are bound within the pages of the builder's guides, pattern books, catalogues, and other forms of architectural literature that have competed for the financial and psychological rewards involved in designing and building a domestic haven for every citizen. In this illustrated survey - the first of its kind to showcase the enormous variety and graphic appeal of these materials - Richard Cheek highlights the more visually arresting and socially compelling examples, focusing on books that reveal the character of our country as much as they do the style of our houses. With over 600 examples illustrated in the text, plus an appendix listing several hundred additional items, Selling the Dwelling is a significant contribution to the bibliography of American domestic architecture.